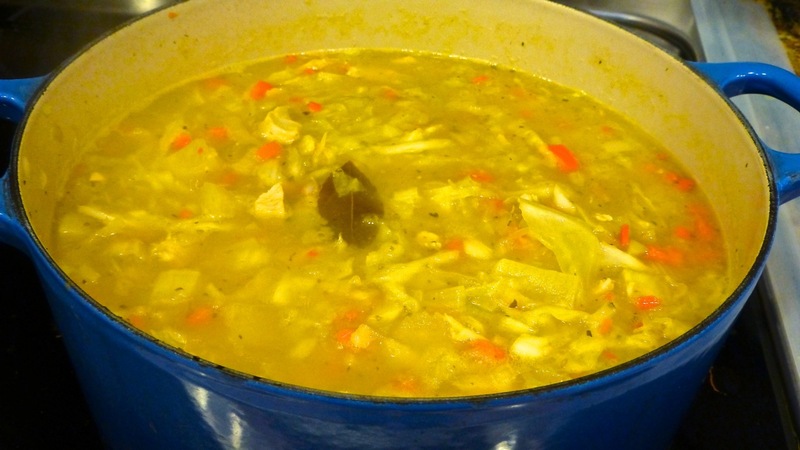 This recipe, called Veselka’s Cabbage Soup, was exceptionally good even though it had sauerkraut. Yes , you heard me right — sauerkraut. 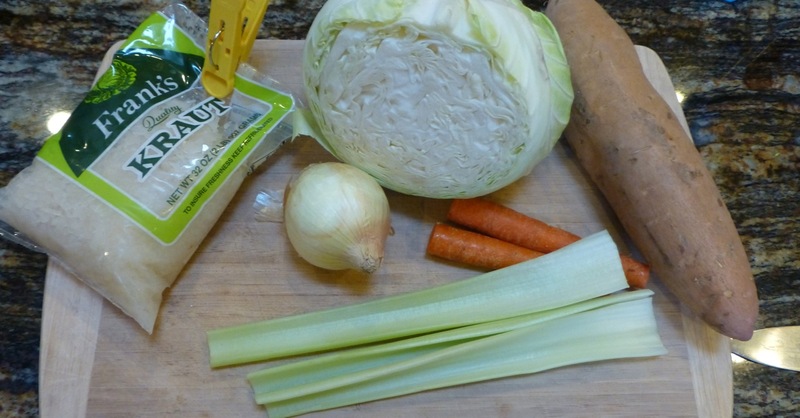 Now, before you move on from this post, let me tell you that I don’t like sauerkraut but this soup surprised me and was really delicious. And look how easy it is to make — not too many ingredients. Hey! How did the marjoram get turned around? I used 2 boneless skinless chicken breasts instead of pork. 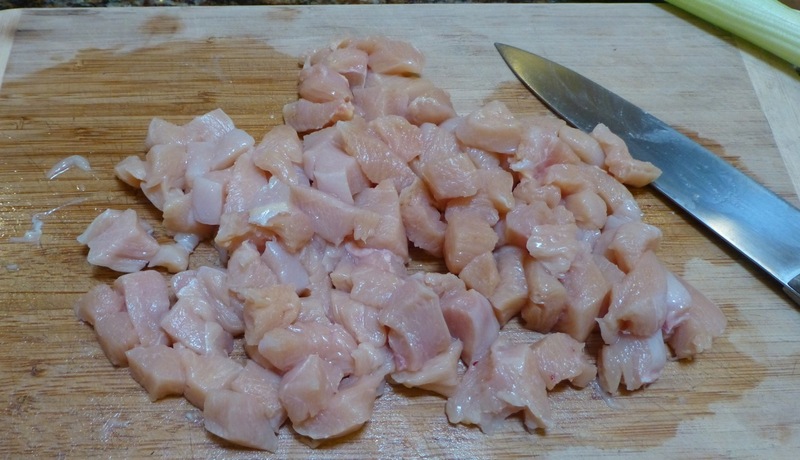 Cut the breasts into small bite size pieces. Everything will be going into a large pot … but not all at once (see directions below). This is what happened to me while I allowed the soup to simmer … my liquid evaporated so I had to add more water to cover the ingredients. Ahhhh … this is much better. Now that I’ve got you hooked, here’s a list of all the ingredients and the directions. 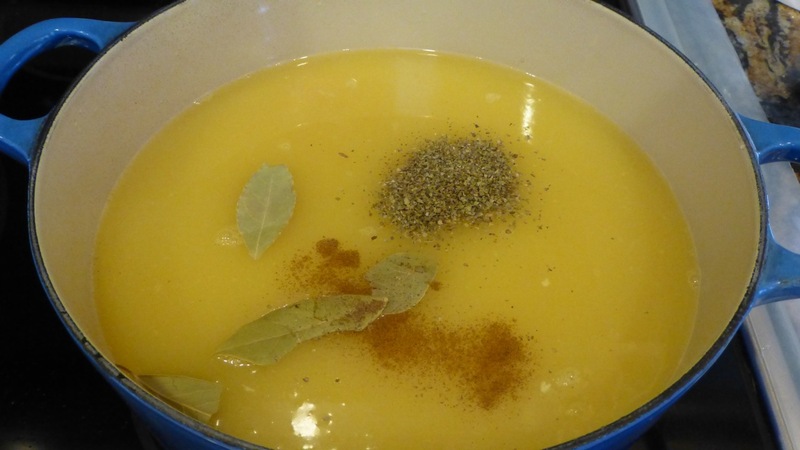 Place the chicken in a large pot with the chicken stock, water, allspice, bay leaves, and marjoram. Bring this all to a boil and simmer on low heat for about 2 hours. Remove the chicken and set it aside on a plate to cool. Skim fat from the stock, leaving a little bit of fat for flavor. Add sauerkraut and simmer for 20 minutes. Add the sweet potato and simmer for 5 minutes. 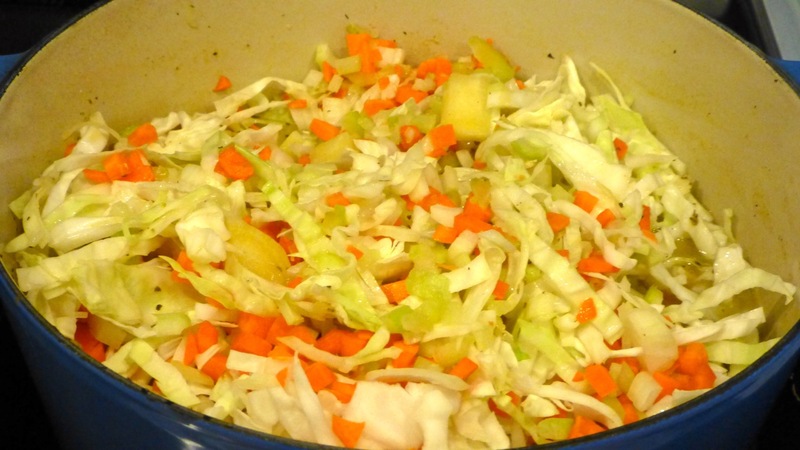 Add the carrots, celery, onion, and cabbage and simmer for another 20 minutes. Add the cooked chicken and simmer for 10 more minutes. 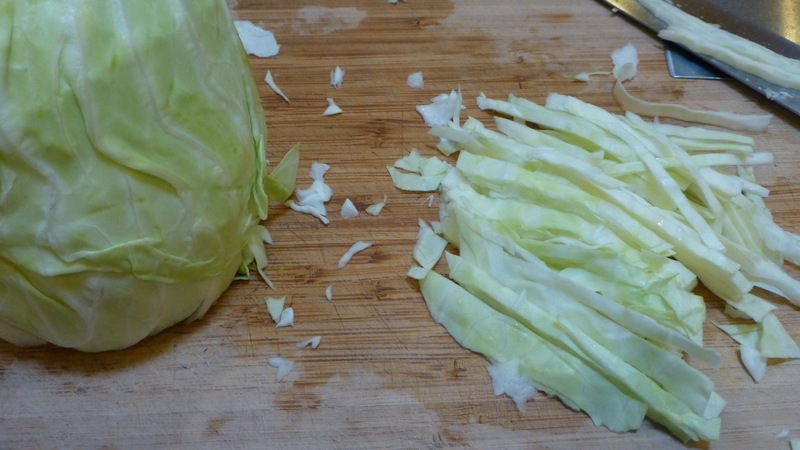 Season with salt and pepper then add the extra sauerkraut juice. Keep your eyes on the pot to make sure your liquid doesn’t evaporate like mine did. 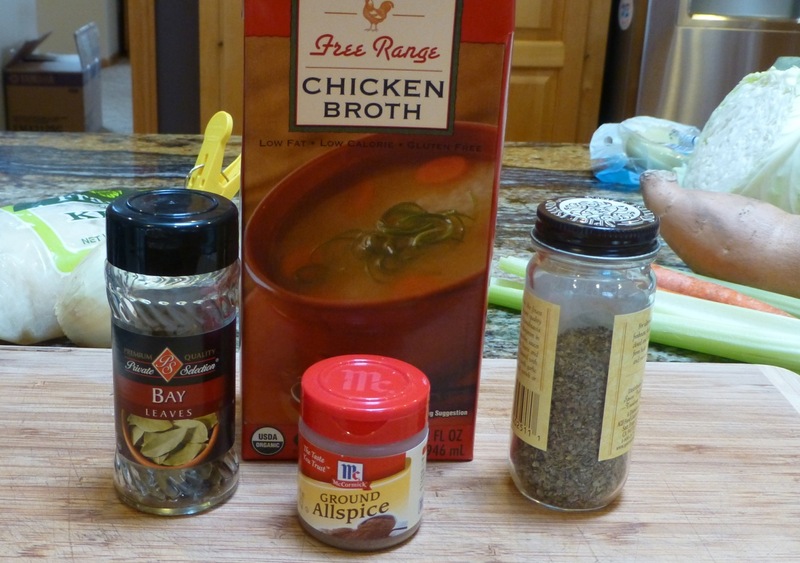 You can add more water or chicken stock — whatever your preference. Give it a try though. I really believe you won’t be disappointed. This recipe has been adapted to be paleo friendly.